Absolute Computers has a repair solution for Dodge, Chrysler, Volkswagon, and Jeep vehicles with a defective TIPM module. If you have a Jeep Grand Cherokee, Dodge Durango, or Dodge Caravan that is not receiving fuel and will not start or drains the battery, read on. Which model vehicles have this problem? TIPM is the acronym for Totally Integrated Power Module. The TIPM consists of a computer, and fuses. The computer contains relays and distributes power to the entire vehicle. If it fails, the vehicle will not start. It may also discharge your battery since it creates a resistive fault from 12V to ground. Since 2001, we have repaired all sorts of circuit boards. This one is no different. We disassemble the TIPM, replace the defective parts on the circuit board, and reassemble the unit and send it back to the owner. Most people do not own the equipment necessary to perform this repair. This was first brought to our attention by one of our local customers who was able to troubleshoot their own TIPM and needed us to repair it for them. We have seen hundreds of messages online about this problem. We were told by a customer that our local dealership repair estimate was in the neighborhood of $1,500. Your local dealer or auto mechanic may have different pricing. Based on our customer’s request, we repaired his existing TIPM instead of his purchasing a new one. First it took a few tries to get it started would the push start; now it will not start at all. It tries to turn over but takes about 15 minutes in order to do so. The vehicle shut off while driving and took multiple tries to get it to start back up. I replaced the expensive battery in my car only to find it dead 10 days later. After a full charge it died yet again. My Grand Cherokee acts like it is out of gas. My Dodge Caravan stalls out and is difficult to start back up. If you do not feel comfortable doing the above, ask a mechanic to remove the TIPM and then send it to us! Step #1: Remove the negative cable from your battery. This is the cable connected to the battery terminal with a – sign. On Dodge Durango vehicles the battery is located underneath the passenger seat. Fold the seat forward, then slide it forward as far as it will go. Next, remove the carpet piece from above the battery. The carpet piece unsnaps. Use a 10MM wrench or socket to loosen the battery cable from the battery terminal. Remove the cable from the battery. Make sure that the cable does not come in to contact with the battery terminal while you are working on the vehicle. Step #2: Open the lid of the TIPM and remove the nut. Do not lose the nut. Once the nut is removed, take the cable off of the bolt and move it out of the way. Step #3: Unclip the TIPM. You can use a flat head screwdriver to unclip each clip one at a time. There are 4 clips total. You may have to do one side at a time and nudge one side up, then move over to the other side. Gently pull upwards on the TIPM. Step #4: Unplug all connections on the bottom of the TIPM. The connectors are color coded. They have a rotating clamp on each connector. There is also a small black release button on most of the connectors holding the clamp in place. Press this down and THEN rotate the clamp on each connector which should eject it off of the TIPM. Pay close attention to this step as you will need to reinstall them when you receive your repaired TIPM back. Ground shipping typically runs around $12 – $15. Place your TIPM in an ESD bag or completely wrap it in newspaper or equivalent if you do not have an ESD bag. Then wrap it with bubble wrap or other soft packing material such as packing peanuts- we recommend at least 2” of bubble wrap on all sides. Do not wrap it in towels or newspapers. Do not allow it to be able to bounce around inside the box. Print the following work order and place inside the box. We will not start work without a completed / signed work order from the customer. Insurance for your package is often only a couple of dollars; purchase this if you are worried about your package being lost or damaged. We would suggest insuring your shipment for $1,500 or the cost your local dealership would have charged you for this part. What is the cost of the repair? We charge $269 for the repair including parts and labor. There is an additional $20 shipping charge via UPS Ground if you cannot pick it up locally. Shipping charges are not refundable. For customers located in North Carolina, there is a sales tax of $3.31 added to the above. We only accept Visa, Mastercard and Paypal for payment over the phone. If you are picking your TIPM up in person, of course, we accept cash. Contact us if you are a business that is sending us multiple TIPMs and wish to pay by check. Typically we will perform the repair within two business days of receipt of your TIPM. We will then call for payment after which we will ship via UPS Ground. UPS Ground delivery times are one business day to VA, NC, and SC. Most of the rest of the eastern US will have a two business day delivery time (the two day shipping time region goes as far west as Chicago, Little Rock and New Orleans). However upstate NY, RI, Massachusetts, VT, NH and Maine are three business days. We may on occasion take longer due to circumstances beyond our control. For example, we close if it snows. For folks from the north, I know this is hard to understand but it is true. Fortunately we only get snow perhaps once every other year. Why did this part go bad? There are relays on the circuit board which fail. We are not sure why these parts are failing so early. Many vehicles get a faulty TIPM in the 40-50,000 mile range. Can Absolute Computers troubleshoot the TIPM? No. we simply replace the relays on the board. The board is not easy to get to. It requires careful disassembly. Once we have the circuit board out we replace the relays on the board. The fuel pump relay is the ONLY issue we fix. If your TIPM has other issues, please do NOT send it to us. We have no way of testing it or repairing it. It should be noted that if the relays have failed, it is usually obvious to our technicians after the disassembly is completed. We replace the components that typically fail with new components and then reassemble the TIPM. How hard is it to replace the part? Taking the TIPM apart is the difficult part. Areas of it are glued together and there are also fragile pins on the inside. Once we have it disassembled we de-solder the old parts, replace them and then reassemble the entire TIPM. If you have experience with replacement of surface mount components on computer boards then the actual replacement of the component(s) is straight forward. However without our equipment or experience de-soldering, removing through-hole SMD components is difficult and you will likely ruin your part by experimenting on it. What if the repair does not fix my problem? If your Dodge Durango, Jeep Grand Cherokee, or Dodge Caravan has 40,000 – 50,000 miles on it and is suddenly experiencing one of the problems listed above, it is most likely your TIPM. We will know when we disassemble your TIPM if your fuel relay is going bad or not. If we repair your unit and your vehicle still does not work, call us, we are very reasonable, strive to keep everyone happy and will issue refunds at our discretion. All of the TIPMs we have repaired to date are working perfectly. Will this need to be repaired again at 100,000 miles since it initially failed at 50,000 miles? We replace the bad relay with a brand new part. We use the identical part. We are not sure if the original parts were faulty or if the parts are inadequate for the vehicle or perhaps some other design flaw causes this problem. The repair may be permanent or you may need to have the TIPM repaired again. Does this repair come with a warranty? No. We replace the fuel relay on the TIPM’s circuit board. We have no way of knowing how this part was designed. Judging by the many complaints we’re seeing online we have no interest in providing a warranty. The old relay will be properly removed, a new one will be properly installed, and your TIPM will be shipped back. Since 2001 we have handled tens of thousands of repairs. This involves someone else doing the disassembly and reassembly, The refund discussed above would be the only option offered if the TIPM repair is not satisfactory. How much is a replacement TIPM? The TIPM has a circuit board that is similar to a computer motherboard inside an enclosure to protect the circuitry from damage. 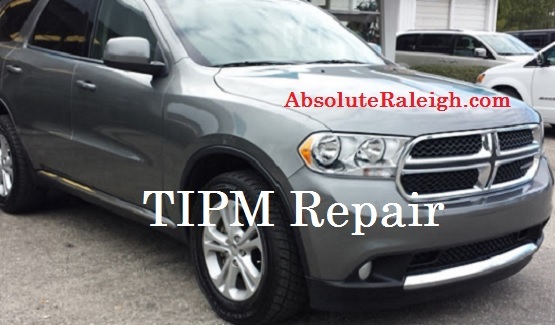 Most dealerships are quoting anywhere from $1,200 – $1,700 to replace the TIPM in a Durango. Does Absolute Computers sell to auto mechanics or offer discounts for volume repairs? Yes. Please contact us for details, discounts will start on the 2nd TIPM repair performed for the same customer in a calendar year. I have other questions, how can I contact Absolute Computers? You can contact us via email at contact@absoluteraleigh.com or via phone at 919-468-3999. Our normal business hours are M-F 9-6 Eastern Time. Why is Absolute Computer’s pricing so much lower than at the repair shop? We are repairing your existing TIPM and are not selling you an entire new circuit board and module. In addition, you are doing the work of removing the TIPM and replacing it after the repair. Is Chrysler going to issue a recall on this product? September 4, 2014 Chrysler announced the recall of nearly 200,000 Durango vehicles. They only recalled certain 2011 model vehicles. To see if your vehicle is one of the models recalled please call Chrysler at 1-800-853-1403. Is there a lawsuit against Chrysler for this product? Yes, there are class action lawsuits against Chrysler for faulty TIPM modules. Search the Internet for more information on these class action lawsuits. Specifically which vehicles are covered? 2011 – 2012 Dodge Durango. All models. This includes models with the 3.6L V6 Pentastar engine. Models include Express, Crew, CrewLux, Citadel, Heat, and R/T. 2011 – 2012 Dodge Caravan. All models. This includes Grand Caravan, VP, SE, SE 30th Anniversary, SXT, Crew, R/T models. Do you repair other TIPMs? If you have another Chrysler product with a fuel problem please send us an email with a picture of your TIPM and a clear description of the problem. By sending us your TIPM, you take full responsibility for any harm or damage that may occur to your vehicle, its occupants, or any person or property as a direct or indirect result of your replacement of this part or work performed on it. If you are concerned with the operation of the TIPM and the safety associated with this repair, please take your vehicle to the repair center or dealership of your choice and have it serviced there. Work will not be started until Absolute Computers receives a work order with all lines filled in and a signature below. TIPM’s will not be shipped to the customer until payment is received. Property left after 60 days will be considered abandoned by the customer and disposed. By sending Absolute Computers my TIPM and signing below, I take full responsibility for any harm or damage that may occur to any vehicle, occupants, person or property as a direct or indirect result of the replacement of this part or work performed on it. I realize if I am concerned with the operation of the TIPM and the safety associated with this repair, I will take my vehicle to the repair center or dealership of my choice and have it serviced there. I am responsible for the shipping / packaging. Absolute Computers is not responsible for damage incurred during shipping. By signing below I authorize Absolute Computers to perform the repair and then call me for payment of $269 plus sales tax and/or shipping as applicable. I agree that the only refund is that described on the web site and no other warranty / refund is expressed or implied.